Teachers, parents, and students enter each school year with anticipation and trepidation, perhaps especially so when a student has a history of behavioral challenges. Dealing with behaviorally challenging students and their parents has been identified as one of the greatest stressors for teachers, and student behavior problems are commonly cited as a leading factor causing teachers to leave the profession prematurely. In the U.S. and Canada, rates of office discipline referrals, detentions, suspensions, and (in 19 American states) corporal punishment, remain at astronomical levels. Understanding and helping behaviorally challenging students is hard, and traditional school disciplinary practices frequently aren’t up to the task. Effective intervention often requires new lenses and new practices. I’ve gone into great details about the foregoing guidance in my book, Lost at School, but here are some key points that should help. Blaming is just as common in the opposite direction. Educators often feel that parents don’t appreciate how hard it is to handle the classroom disruptions of behaviorally challenging students, especially when classroom teachers are under enormous pressure to get every student over the increasingly high bar set by high-stakes testing (the standard by which teachers are judged). While many educators are invested in helping their behaviorally challenging students, they often haven’t received training on how to best accomplish the mission. Perhaps the most compelling finding from the research that has accumulated on behaviorally challenging kids over the past 40-50 years is that lagging skills (rather than lagging motivation) is the primary factor contributing to challenging behavior. That probably explains why characterizations such as “attention seeking,” “unmotivated,” “manipulative,” and “limit-testing” aren’t very accurate, and why all those sticker charts, time-outs, trips to the office, detentions, suspensions, and paddlings aren’t helping very much. It’s far more productive to identify the skills a child is lacking–skills such as flexibility/adaptability, frustration tolerance, and problem-solving–so as to come to a more accurate understanding of the true factors making it hard for a child to meet academic and behavioral expectations at school. In other words, behavioral challenges are a form of developmental delay, and are really quite similar to other forms of developmental delays (reading, writing, language, math) that are commonly seen in schools. Of course, identifying lagging skills also helps adults stop blaming the student for his behavioral challenges. If he could do well, he would do well. It’s very tempting for adults to focus primarily on the behaviors a student exhibits—hitting, biting, screaming, swearing, belligerence, and so forth—when he’s having difficulty meeting expectations. But it’s usually far more productive to focus on the problems that are causing those behaviors (I call them unsolved problems): for example, difficulty getting along with a particular classmate at recess, difficulty standing in line for lunch, difficulty sitting next to a particular peer during circle time, difficulty on a particular academic task. The switch in focus helps shift the adult role from behavior modifier to problem-solver. It’s not uncommon for classroom teachers, counselors, and administrators to focus exclusively on a student’s behaviors for an entire school year and never solve any of the problems that are causing those behaviors. This is demoralizing for educators, parents, and students, and, over time, causes kids to become hopeless, alienated, and disenfranchised. I’ve developed a brief instrument to assist in identifying lagging skills and unsolved problems—it’s called the Assessment of Lagging Skills and Unsolved Problems and can be found both in Lost at School and on the website of my non-profit organization, Lives in the Balance. Even when adults are in problem-solving mode, they often come up with unilateral solutions that they then impose on a student. These solutions are usually based on no information or buy-in from the intended beneficiary of the solution: the student. While there’s no question that adults may have great insights about a student’s difficulties, and outstanding solutions to offer, it’s far better to view the student as a collaborative partner, one with extremely important information to provide about the problems that are causing challenging behavior, and with (often surprising) ideas about how those problems can be solved. The same notions are equally applicable to problem solving between parents and teachers. Often teachers and administrators impose solutions and expect both students and their parents to abide by their decrees. Once again, better for the adults to come to a consensus on what’s truly getting in the way for the student (with significant input from the student himself) and then work together toward solutions. There are many benefits to solving problems this way, including the fact that both parents and educators have unique expertise to offer on the same child, and that there’s no one to blame when solutions don’t work as well as hoped (since those solutions were a team effort). By the way, solutions that aren’t working aren’t cause for returning to old, punitive, unilateral ways of dealing with behaviorally challenging kids; rather, it’s reason to return to the problem-solving table to come up with improved solutions after figuring out why the initial solution didn’t quite accomplish the mission. A lot of intervention that takes place in schools occurs emergently and reactively, in the heat of the moment. But that’s very poor timing on solving problems, and helps explain why many problems remain unsolved. Fortunately, when schools routinely use the Assessment of Lagging Skills and Unsolved Problems, challenging episodes become highly predictable, and the stage is set for the collaboration on solving problems to be planned and proactive. Of course, many members of the school staff wonder when they’ll find the time to solve problems proactively with their students. While it’s true that, in many schools, time had to be carved out of already-busy schedules to solve problems with their most at-risk students, most of the concerns about time come before staff begins solving problems collaboratively and proactively with their students. Over time–after they’ve been doing it for a while–it’s common for staff to have concluded that solving problems collaboratively and proactively actually saves time. Dr. Ross W. Greene, author of the acclaimed book The Explosive Child, offers educators and parents a different framework for understanding challenging behavior. 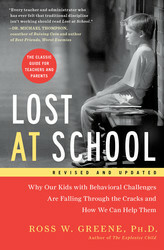 Dr. Greene’s Collaborative & Proactive Solutions (CPS) approach helps adults focus on the true factors contributing to challenging classroom behaviors, empowering educators to address these factors and create helping relationships with their most at-risk kids.This revised and updated edition of Lost at School contains the latest refinements to Dr. Greene’s CPS model, including enhanced methods for solving problems collaboratively, improving communication, and building relationships with kids. Dr. Ross W. Greene is associate clinical professor in the Department of Psychiatry at Harvard Medical School and the author of both Lost at School and The Explosive Child. He is also the founder of a non-profit organization called Lives in the Balance (LivesintheBalance.org), through which he disseminates the model of care described in his books, Collaborative Problem Solving. Dr. Greene’s research has been funded by the US Department of Education, the National Institute on Drug Abuse, the Stanley Medical Research Institute, and the Maine Juvenile Justice Advisory Group.